The kitchen upgrade is moving along at an incredibly slooooow pace. As I mentioned before, once things started leafing out in the yard, we've had to take a good amount of our free time to attend to that before things got out of control. 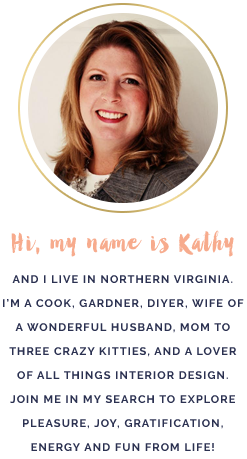 We live on 4 acres, which is nothing out where we live, but it's enough to keep two people who also work full-time jobs veeery busy. These past two weeks we've been framing and filling in the space above the kitchen cabinets. The doors are down in the basement and are ready for their final coat of paint! First, we followed Cristina's example at Remodelando la Casa and installed 1"x 2" pieces of wood to the ceiling and back edge of the cabinets. 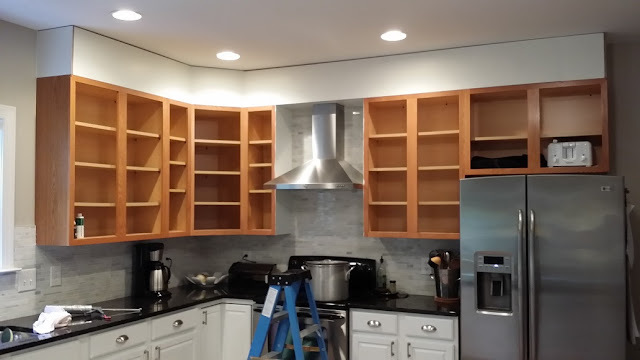 This looks like it would be easy, but we had to make sure the wood framing pieces were aligned completely straight with the edge of the front of the cabinets. 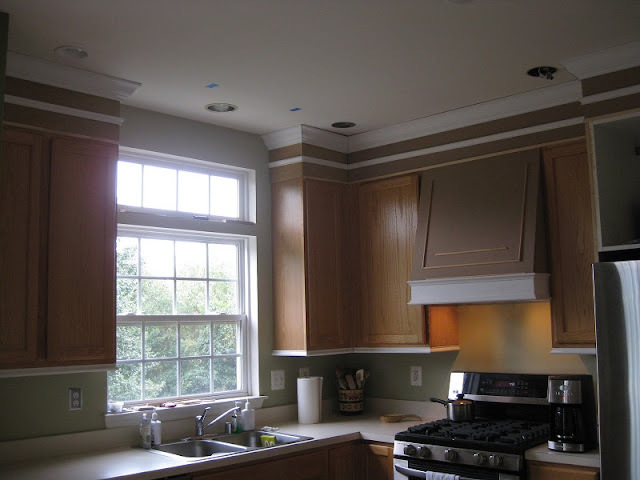 Our cabinets were 3/4" thick, so we had to find our front edge on the ceiling and measure back 3/4" inch. This actually took us an entire day to do in order to get it right. 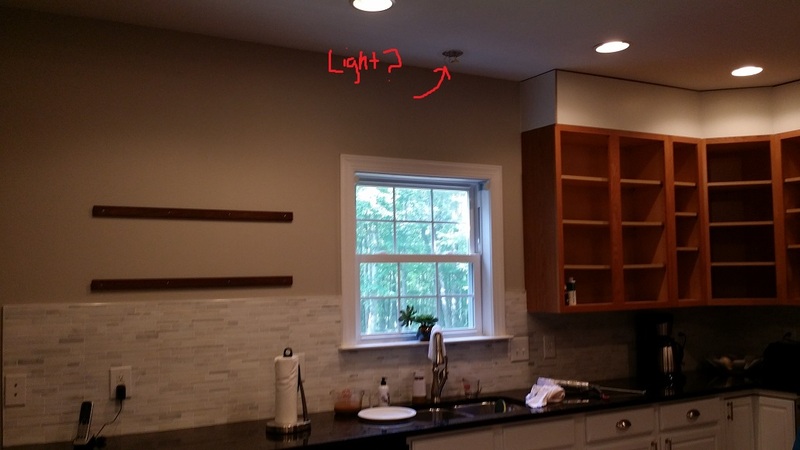 Next, we installed our measured, cut, and primed pieces of MDF to the front of the wood frame pieces and nailed them in with a nail gun. 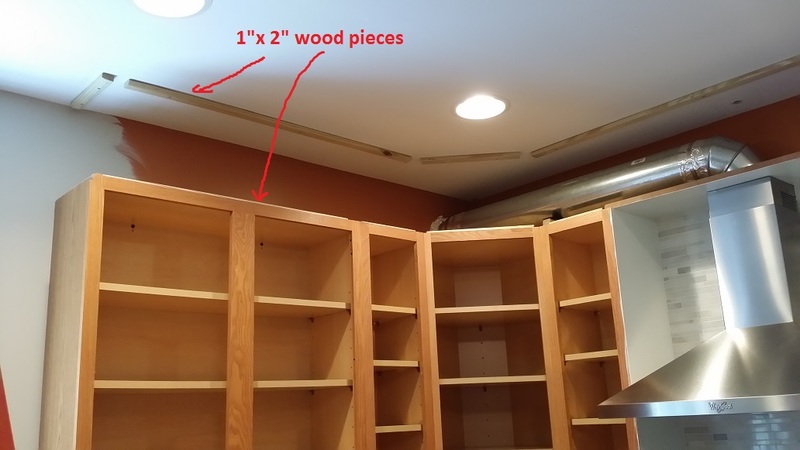 I actually had to do a "hybrid" installation of nail gun and Liquid Nails, as the impact of the nails going into the bottom wood frame pieces would push them back from the edge of the cabinets. I tried back nailing the wood pieces to make them more secure, but it didn't work. 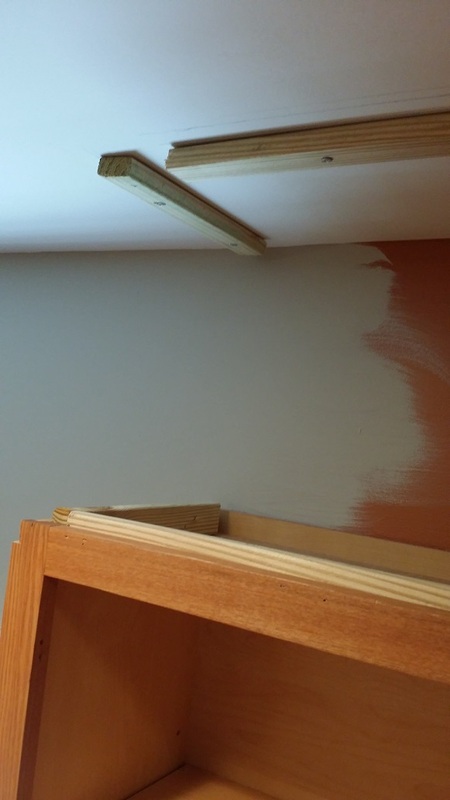 So, the top of the MDF was nailed into the ceiling pieces of wood frame and then Liquid Nail-ed on the bottom. I am SOOOO close! All I need to do now is finish priming the cabinet frames, add a little wood putty to the edges of those MDF corners, add my crown moulding and trim, and paint. In writing, this sounds so effortless, but I am determined to have this done by the end of this month! In other news, the cleats for my floating shelves are installed and the shelves look WONDERFUL! I don't have them up in this pic as I know that once I start sanding and priming the cabinet frames, everything is going to get dusty. Just one less thing to clean. 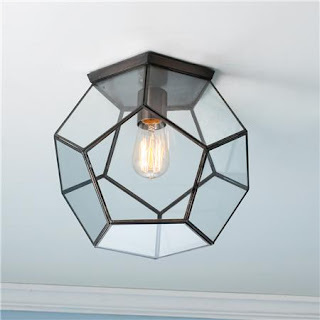 My beloved hexagon globe light from Shades of Light came in last week and is proving to be a MAY-JOR pain-in-the-arse to install. We are on day 3 of our attempt and have made no less than 3 trips to Home Depot for additional hardware.....grrrr! WE WILL CONQUER THE LIGHT!!! Afterwards, I will have some choice words to use in my review of this beautiful, but finicky piece of house bling.